Okay, so the week leading up to Labor Day weekend had been rough for all of us. By Tuesday, we knew we wanted to leave town. We had already been considering going to Walt Disney World for the weekend, but didn't think it was a possibility since there were no flights leaving from GSP to Orlando-Sentinel Saturday morning. However, desperate times call for desperate measures, and we sure were desperate for some Disney Magic. Dad offered to drive all Friday night after the football game so we could be in Orlando by Saturday morning. On Thursday, he booked us a room at the brand new Bay Lake Tower at the Contemporary Resort (had just opened two weeks before). I booked us really nice ADRs (Advance Dining Reservations), including Donald's Breakfast Safari, San Angel Inn, 1900 Park Fare Supercalifragilistic Breakfast, The Wave, and Crystal Palace. Disney Magic Your Way park tickets aren't a good deal unless you purchase at least seven days, considering the more you play, the less you pay (price per day decreases per day on your pass). So, we decided to go all out and purchase the 10-day no-expiration park hopper MYW tickets. Of course, with no expiration, the more days, the more expensive the no expiration perk. However, this is still a much less expensive route than purchasing the 3-day MYW, considering we will be back to WDW multiple times. Now, I'll admit that I'm not being 100% original on the Disney blog entries, considering I am for the most part copy/pasting my Trip Report on www.mousebuzz.com. However, I realize that MouseBuzzers know most everything about Disney, and vacation blog readers might not, so I'll try to explain the Disney-speak. So.... Friday night, we all went to the football game. Rachel is a cheerleader and I'm in the marching band (lol, like that song... guess I'm the nerdy one, here). 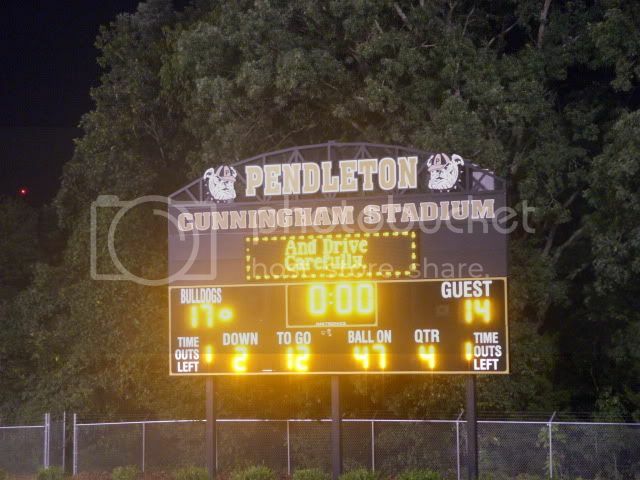 The bulldogs won 17 to 14. It wasn't exactly a pretty victory, but hey, we won. had to stay to march the show after the game, so I got home a bit later. We all showered and loaded our bags into the Yukon (I had a small duffle, a tote with my clothes for the next day, and a tote with my entertainment items). I sat up front with Dad. Mumsy got the middle seat, and Rachel got the way back. As soon as we left, I probably could've fallen asleep because I was so exhausted from the game, but text messages from a very cute football player kept me up... til 3:00 AM. Then, I had difficulty sleeping. I kept thinking, "I'm going to Walt Disney World... I should get some sleep." But it wasn't easy. Dad bout fell asleep... that's when Mom decided she would drive. I kept hearing Mom and Dad converse and I was just in this daze... I was like asleep, yet fully aware of my surroundings. I believe I slept from 4:00 to 6:20. We stopped at that parkway rest area to change for the day. I was a bit hesitant of changing in a rest area (imagining the worst), but it was actually quite clean. I was also relieved to find other ladies doing the same thing. There must've been 10 or so of us lined up on the counter fixing our make-up and hair.